Gracefully sculpted large dolphins polished brass stand holds your finest gemstone spheres and crystal balls. This solid brass stand holds spheres from 2 1/2" to a whopping 6" wide. The lacquered finish assures long term easy care. 100mm Amethyst sphere shown is sold separately. Bright and cheery polished brass frogs stand brings the garden indoors and holds crystal balls or paperweights from 2 3/4" to 6" wide. This solid brass stand has a lacquered finish to assure long term easy care. Charming verdigris finish solid brass frogs stand with antique brass accents brings spring and the garden indoors. This stand holds crystal balls or paperweights from 2 3/4" to 6" wide. This solid brass stand has a lacquered, satin finish to assure long term easy care. 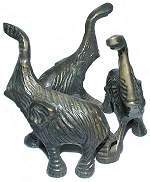 Medium antiqued brass Elephants stands simulates native wood carvings. This Safari decor accessory holds crystal balls and spheres from 4" to a 5" wide. The lacquered finish assures long term easy care. Large polished antique gold tone Elephants stand simulates the rich character of native wood carvings. 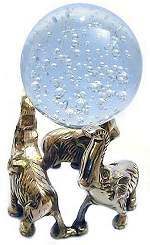 This Safari decor accessory holds crystal balls and spheres from 3" to a 6" wide. The lacquered finish and felt base assures long term easy care. Seen with a 100mm bubbled crystal ball, which is sold separately. This superb stand is a horse lover's dream! Finely sculpted stallions kick up their hooves to hold crystal balls or paperweights from 2 1/2" to 7" wide. This polished solid brass stand has a lacquered finish to assure long term easy care.